I’ve mentioned Kickstarter a few times on my blog. 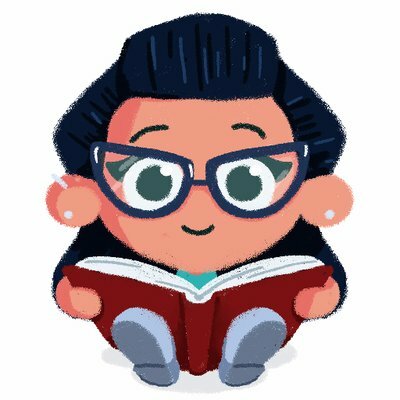 I love how people are able to fund their own books using crowdfunding, and I have supported various projects over the years. However, last month was a pretty epic one when I received THREE brilliant children’s books, funded through crowdfunder campaigns, and one fantastic adult graphic novel. These books are now all available for general purchase, and they are perfect examples of books which have been created and released without publisher support, yet are exceptional quality reads for children. 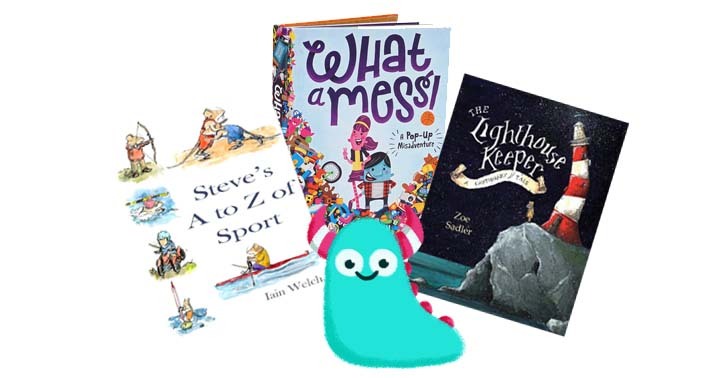 What is impressive about the three books I’m blogging today, is they are the sole creation of the illustrators and authors themselves, through their own skills, passion and sheer determination! That’s a very great thing. First up, we have the first book I backed and received, What A Mess! A Pop-Up Misadventure by Keith Allen. I’ve said it before, i’m repeating it again, I LOVE a pop-up book! They’re exciting, engaging and clever. However, I have never seen a pop-up book quite as spectacular as this one. Keith has created a marvel in this! It tells the story (based on his own experience) of two messy children, who refuse to clean up their bedrooms. One day, the mess gets out of hand and an almighty explosion results in a near impossible clean up task! 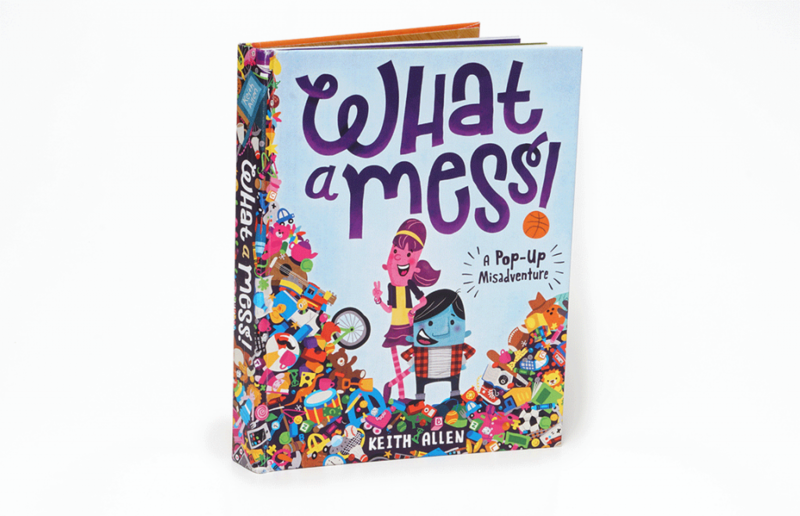 This is the perfect book for those messy children who won’t or don’t put their toys away. But it’s also just a ridiculously fun and silly book, the ideal read for just sheer entertainment! Keith is the pop-up master, and I can’t begin to imagine how many hours, days, months even, went into designing the intricate, yet sturdy pop-ups in the story. Each page contains one large explosive pop-up which leaps out of the page, with depth and bright colours, and then one little miniature pop-up under a flap in the corner. It’s exceptionally well done and works perfectly. So expertly executed is this book, that none of the pop-ups stick when you open them, or fall apart after a few page turns (believe me, my book has had some hammer already), it just works! Just because What A Mess is beautiful to look at, a 3D work of art, does not mean it skimps on story. The story is fun and clear, not over told, but quite simple. It rhymes absolutely beautifully, with a lovely flow to it. in a house where two children shared the same space. but soon it became neither straightened nor swept. But brother and sis didn’t mind all the mess. I seriously cannot find fault with this superbly put together book. 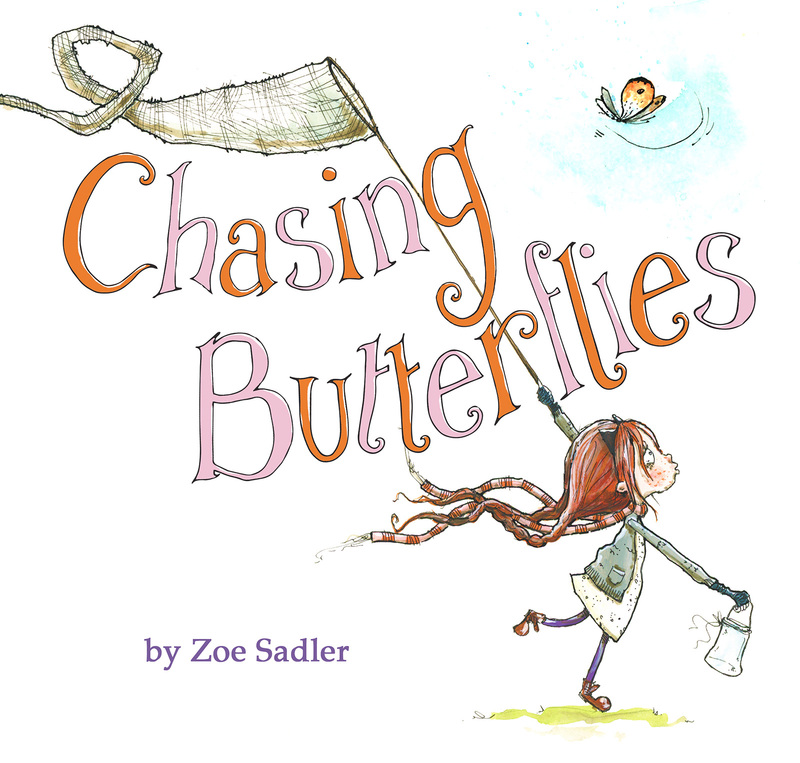 Colourful and vibrant illustrations, fabulously fun writing style and a story so many children (and adults) of all ages will enjoy and identify with. I’m absolutely thrilled to own this gem of a book. Next is my second backing, and one very close to my heart, Steve’s A-Z of Sport by Ian Welch. I have known and followed Ian on social media for over a year now his character design and landscape art is beautiful to look at, he’s a very skilled illustrator and a genuinely lovely friend. 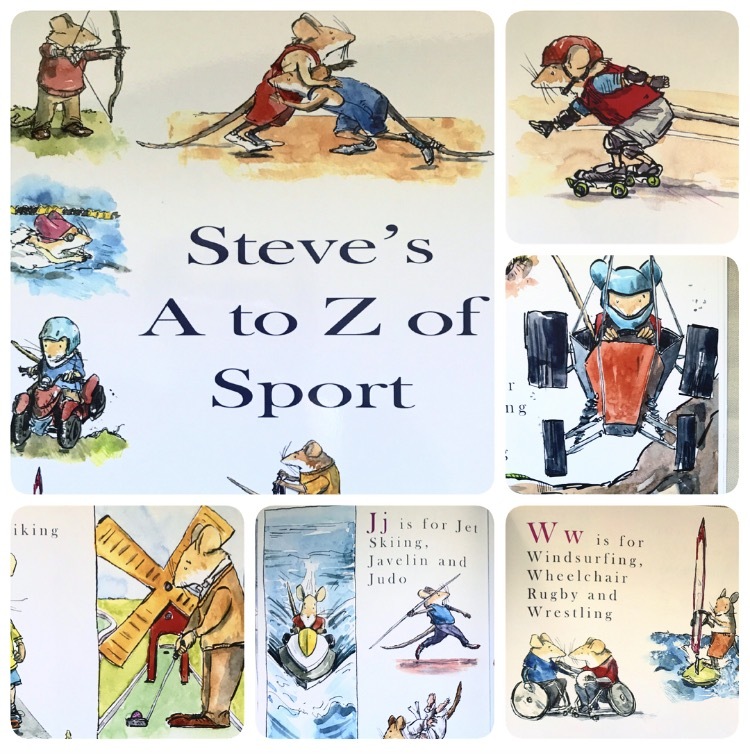 So, Steve has been adventuring all over the Twitterverse for quite some time, and after numerous demands from people to get him in a book, Iain created this A-Z of sport, showing Steve’s adventurous side. As it says on the cover, this is an A-Z book, so we travel through the alphabet, and with each letter, we are treated to generally three different sports, and illustrations of Steve the mouse participating in them. Oh I honestly love this book. It has a lovely quality feel to it, with a thick glossy paperback cover, and gorgeous bright illustrations inside, it’s an absolute work of art! This book contains every colour under the sun and every sporting activity you can imagine, so the pictures are bright and interesting and exciting and bundles of fun. It feels like an art book as much as a children’s book. I really love it and was so thrilled to have backed this project, seeing such a stunning end result. At the library we are constantly asked for A-Z books. It’s a great way to get very young children learning the alphabet, while also developing their general knowledge and vocabulary. And in this book, they learn about different sports too, which is really appealing to young adventurers! I know this book will slot in very nicely and be my go to choice for A-Z requests from now on. There’s no doubt that children will find the vivid illustrations and exciting activities fascinating to look at, while enjoying this ever endearing yet brave little mouse character of Steve! 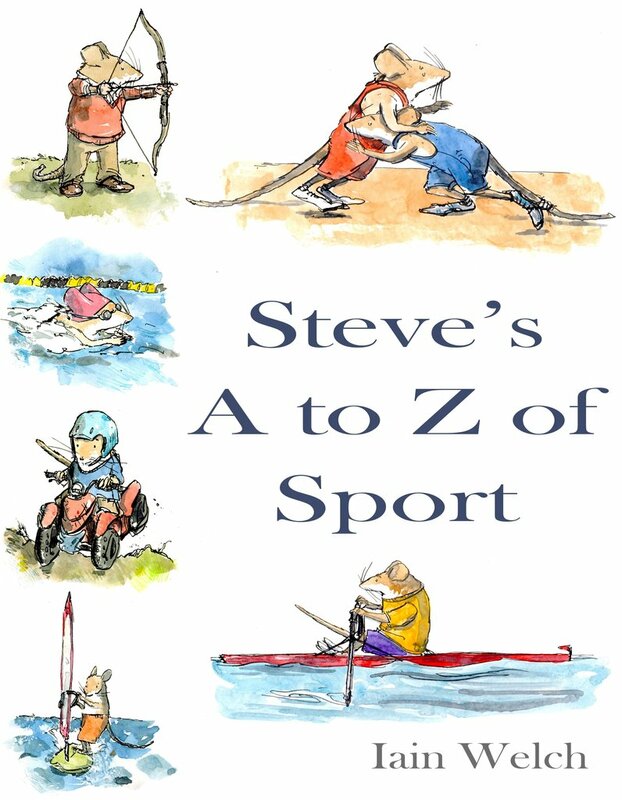 Steve’s A-Z of Sport is another example of exceptional workmanship from a talented illustrator and the perfect read for the bookshelves. Well done Iain! You can purchase the book Steve’s A-Z of Sport in Ian’s online shop, so get it now before it sells out. Iain also sells some fab other products, including Steve’s sports art print to match the book. 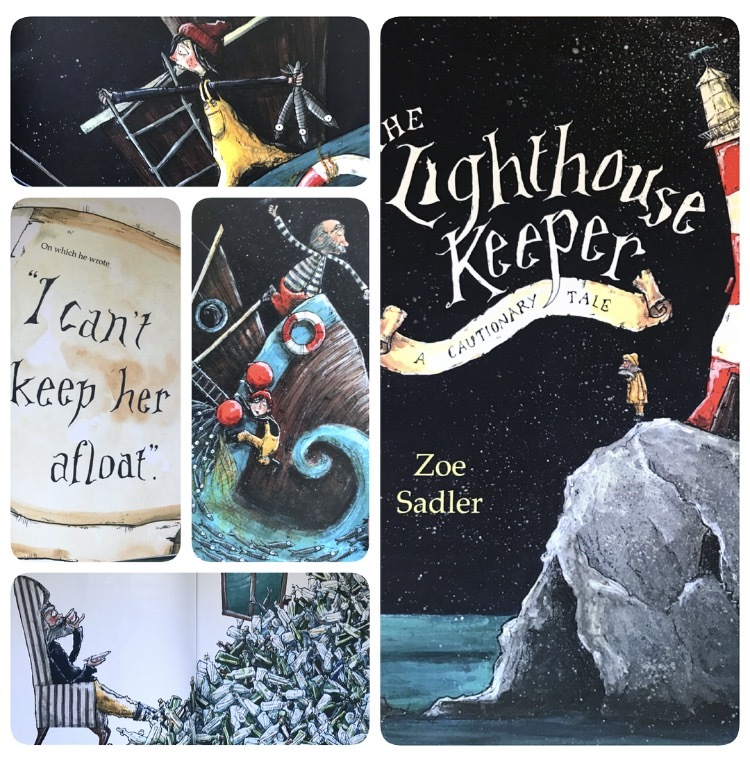 Last but not least, my final crowdfunding creation, The Lighthouse Keeper – A Cautionary Tale by Zoe Sadler. Now, I sadly didn’t get the opportunity to back this particular project, as I didn’t know about Zoe when it was live. However, she was kind enough to send me a copy of her book, and had I seen it at the time I would have backed it without question. 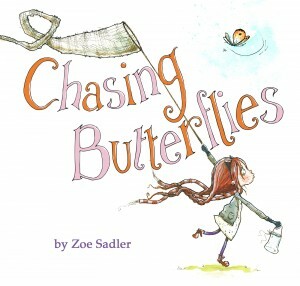 I’m a huge fan of Zoe’s illustration style, it has so much texture and a really quirky and unique feel to it. The story itself is no exception, it’s actually quite a dark little tale, so be prepared for that. 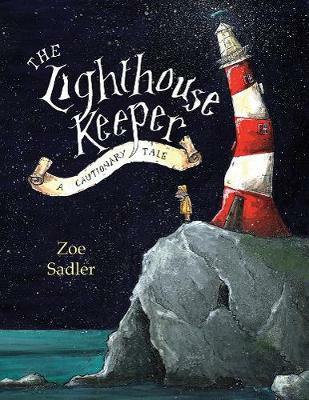 The Lighthouse Keeper tells the story of, to be frank about it, a rather tardy lighthouse keeper, who goes for a snooze and fails to keep a close eye on his rather unreliable lighthouse lamp. As a little fishing boat approaches, the light flickers and goes out, and the small boat is swallowed up in fog! This book has an almost folk tale feel to it, not necessarily filled with sweetness and light and happy endings, it’s entertaining and fun and a really unique little story. I loved the writing style, written in rhyming couplets on each page, the rhythm and flow reads beautifully. My personal take on this story is that it’s an anti-fishing message, but I do feel you can interpret it in any way you like, it’s left quite open for discussion which I like a lot, and everyone I showed it to had something different to say. My absolute favourite aspect of this book, however, are the illustrations. They’re completely immersive, as they flood every inch of every page, and the paint style is simply stunning. It has texture and depth, and a sketchy style with bags of personality in all the characters, even down to the fearful little fish. Everything about them appeals to me and enhance this rather haunting story. 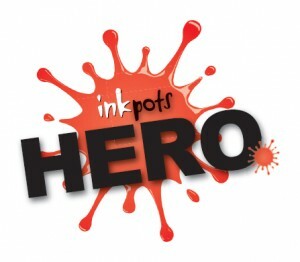 Another quality publication all created by one determined illustrator and storyteller. I have huge admiration for the skill of these people. Thank you for reading this rather crowded Book Monster review.